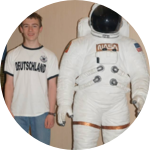 I am currently an engineering student at Virginia Tech, and plan to double major in aerospace engineering and physics. Following the completion of my undergraduate studies, I hope to pursue a doctorate in astrophysics. I have been fascinated with outer space my entire life, and aspire to become an astronaut. In my spare time I enjoy aviation, backyard astronomy, building rockets, painting, and running. In the 8th grade I founded Space Chargers with the objective of placing a payload into suborbital space, a goal that was achieved on September 17th, 2018 with the launch of the Eagle 1 payload.